Doing business in a foreign country can be confusing. That’s where a local real estate agent steps in to help. 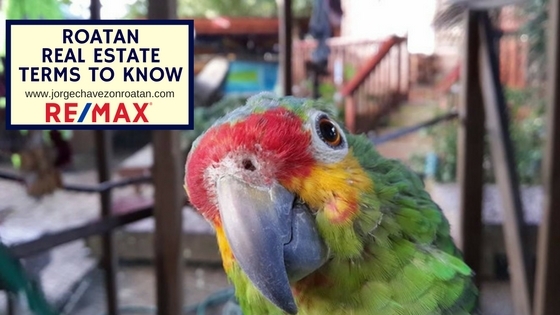 Let’s go through some Roatan real estate terms to know so you have an idea of what to expect with your real estate transaction. Terms are given alternatively in English and in Spanish; most legal matters seen by real estate agents in the Bay Islands are mixed and are loosely translated in private sales agreements. For general FAQs on Roatan real estate, check out my buyer’s info here, seller’s info here, and Roatan real estate FAQs here. Dominio Pleno: This is the title issued by the municipality to an individual who does not have valid title but has been living on or in possession of the property. The individual must petition the municipality for it and pay 10% of the value of the property. (Some proof of ownership is usually provided). Public Document: “Escritura Publica” transfers the title before a Notary, in which one party sells, donates, grants, trades, or in any way transfers titles and another party pays and/or accepts the transfer. Protocolo/Protocol: The continuous book of public documents kept by a Notary during a fiscal year. Sent yearly to the Supreme Court Secretary to be kept as a public record. Antecedent: The public document from which you receive your current title. This is the public document that enables you to register your title and on which the marginal annotation for transfer of the current title has been written. It’s the chain of title that exists on any given document and must appear on a public document in order for it to be recorded. Cadastral: The municipal land office that handles the survey and measurement of all property within its delimitated territory. Certificate Cadastral Map: Survey issued by the land office at municipality on property submitted to registry. Survey: Map of property, which must accompany documents to registry and can be made by an engineer or by the cadastral office and it usually done by both. Meets and Bounds: Measurements and boundaries, usually referring to the polygonal data on map or survey as well as indicating neighboring property and owners. Easements: Right of passage, conduits. Commonly known in Honduran legislation as Servidumbres. Horizontal property: Special regimen that buildings such as condos and apartments are subjected to. Special document must be prepared to subject property to horizontal property regimen and all covenants and restrictions must be stated as well as managements and common areas and all regulations to which each owner will be subjected. POA: Power of attorney- Power to represent another individual or company, in Honduras done before a Notary in Escritura Publica, when done overseas, it must be authenticated by a notary and carry an APOSTILLE or be authenticated by a Notary at a Honduran Consulate abroad. APOSTILLE: Certification issue by one of the subscribing countries of the 1961 Hague Convention that validates a document issued by one of the other subscribing members of said convention. International agreement to validate documents originating in and destined to subscribing countries. The age of a document is not a determining factor, only public documents done before a Notary, a Titulo Supletorio petitioned before a court of law or Dominio Pleno issued by a Municipality can be registered. Transfer of title: Only “Public documents” (any of the above) can be transferred by a public document. You must have a public “Registered” document to transfer the same rights in another public document. Title search: The registry of documents in Honduras is public, meaning the public (any ordinary citizen) is able to see all documents that have been filed and registered at said office. Liens, easements, mortgages. These are of interest to real estate agents, as they determine the value of the land and what other documentation is required to deliver a clean title. If the title has been transferred from a public document (which was not always the case) or if by Titulo Supletario or Dominio Pleno. How far back the title goes and how many times the title has legally changed hands. In the event the lands are owned or were owned by a corporation, who owns the corporation and who is the representative of the corporation. Sale outright: Tradición de Dominio por compra-venta. One party selling, one party buying, sale price is paid. Sale of share in a corporation that owns property. Transfer is then of the company and not the property, but amounts to the same thing as the partners who own the property change. Permuta: Trade: Exchanging the property for another of estimated equal value, or for another object. Dacion de Pago: Property can be given in lieu of payment of a debt. Donation: The person or entity that owns the property donates it to another, free of charge or in exchange for services or rights retained on said property. Take caution with these transfers, as they are revocable under a special clause called “ingratitude”. There is a procedure that must be followed prior to the transfer of property. The legal heir must first be declared as such by the court, known as probate if there is a will, intestate if there was no will, in which family is called to succeed by order of familiarity. Your attorney will handle this. Always check with your own attorney for validity of inheritance – this can be tricky. There have been problems before as the law does not state that all relatives who have a right to succeed when there is no will must declare themselves heirs simultaneously, so the individual claims are registered at different times and property can then be sold off by only one heir. I realize it can be confusing to do business in a foreign country. I’m here to help facilitate the process easily and seamlessly for you! Contact me with any questions any time.